This beautiful 3 piece cutlery set from our Navajas tableware collection consists of a table spoon, a fork, and a serrated table knife, all made of high-quality stainless steel. Bring a modern design and delicate style to your table. Find out more on Supreminox.com. The Navajas collection cutlery possess an excellent resistance against stains and oxidation, it’s dishwasher safe and an ideal option for a professional use in hospitality industry. All the pieces are made of 8/10 stainless steel with a polished finish, bringing a fine dining to your table. A triple-rivet stainless steel handle is resistant and durable and thanks to its fine curvy shape fits perfectly in a hand. Available in packs of 10 x 6 units (60 units). 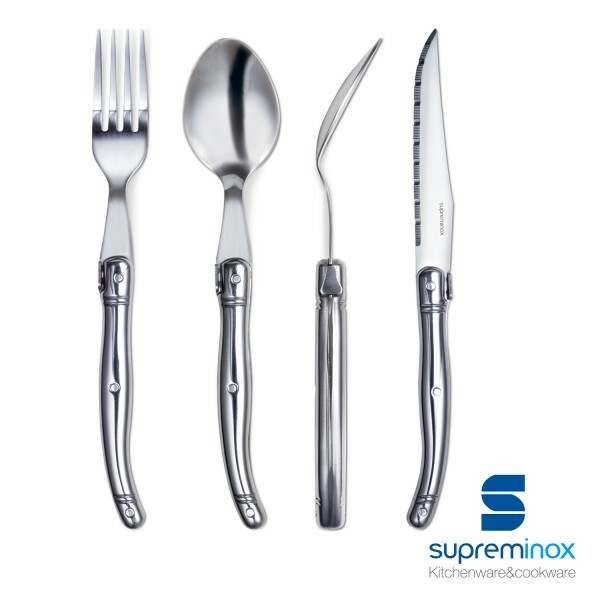 Find out more about our Navajas tableware collection on Supreminox.com. Order online here.